We have a chance to chat, go over our days, and hopefully pray. This has been a great step forward in family life, however it has required me to amass a few more breakfast recipes! And so I discovered this one, which we have about once a week. Mix the dry ingredients. In a separate bowl or jug mix the wet ingredients, and add to the dry. Stir until moistened/mixed and then add berries. 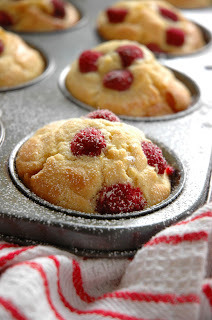 Put into a greased muffin tin (or use paper muffin cups) and bake at 180 for 12-15 minutes. Enjoy! Really, this recipe is so easy--it takes me about 5-10 minutes to whip up, and I can pop them in the oven and have a quick shower while they're baking! I wasn't sure about the cornmeal and yogurt when I first made them, but actually those ingredients help to make the muffins moist and delicious! Family meal time is so important. I think more people should take the time as it brings us closer together. I like your recipe, looks great. Thanks Tina! I made them this morning--very yummy! Having lived in a variety of places and most recently New York City, I now enjoy village life in a small market town in Wales and being wife to one and mother to five ages 5 to 20. I write novels, including Willoughby Close and The Hartley-By-The-Sea series, all based on my own idyllic experience ;). My latest novel, The Secrets We Keep, is out now.